The tropical city of Cartagena de Indias, on Colombia’s Caribbean coast, is Colombia’s flagship tourist destination. Boasting colonial era buildings, historic forts and easy access to miles of beaches, Cartagena attracts large numbers of international visitors each year. Its centerpiece is the 16th century walled city; today home to narrow cobbled streets, beautiful architecture and a series of charming plazas. The city’s low lying coastal situation and proximity to the equator, means it enjoys high temperatures year round (averaging 28°C). Constant sunshine makes weather conditions perfect for visiting the various beaches located on the city’s edge, or a short boat trip away from it. The architecture within the walled city – a mixture of baroque, neoclassical and Spanish colonial styles – and the colored facades of the buildings gain a distinctive and attractive tint in the Caribbean sunlight. Cartagena is the destination in Colombia which best caters to high end tourism. Throughout the old town there are a large number of luxury hotels, a good selection of mid-range to upmarket restaurants, as well as a number of designer and boutique stores. Most of these have English speaking staff, a pretty rare thing in Colombia. The whole area is immaculately clean, exceptionally well-policed, and has a constant stream of street performers showcasing local music and dance traditions. All this makes Cartagena popular for romantic breaks and upmarket trips. If you've seen other parts of Colombia though, or if you prefer your cities a bit more gritty, central Cartagena can seem overly sanitized and fake. Picturesque yes, but a real representation of Colombia? Definitely not. While Cartagena has a number of standout attractions, it is not particularly famous for its nightlife. The destination is popular for romantic breaks and many of the visitors there are young couples, or married groups and their families. As such, evening entertainment tends to focus more around eating well and having relaxing drinks in the walled city. A few more lively spots are nearby, playing upbeat Latin music, but they cannot compare with the range and standard of bars and clubs in Bogota, Medellin or Cali. 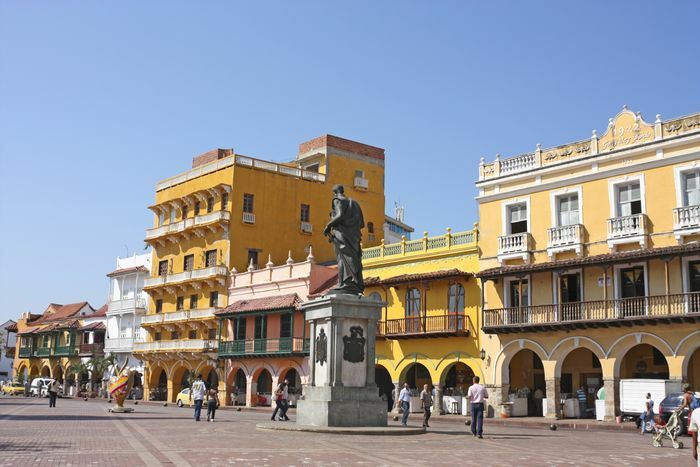 Cartagena has always played a vital role in the Colombian economic and political system. It was one the major settlements of the Spanish conquistadores and, as a port city, it became a key center for trade. In 1811, it was the first part of Colombia to declare independence from Spain. As one of the first cities founded by the Spanish in South America, parts of Cartagena's civil and military architecture dates back some 500 years. The cultural significance of Cartagena’s historic buildings led UNESCO to declare the walled city a World Heritage Site in 1984. Around the perimeter of this site runs a seven-and-half mile long wall, which was built in the 16th and early 17th centuries to in order to protect the city from attack. One of the largest of the colonial-era structures is Castillo de San Felipe. This was a fortress built by the Spanish in the 17th century as a means to help protect gold-carrying boats from pirate attack. Nearby is the Santa Cruz monastery, which is situated atop La Popa hill and offers an impressive view over the city and its harbor. The site also features a colonial museum and a small chapel built in honor of Cartagena’s patron saint, the Virgin of Mullein. Another site of note is Plaza de los Coches, the central square in the old town, which is home to a parade of restaurants and bars and is the site for regular live shows of dance, music and other performing arts. Immediately adjacent is to the square is Puerta del Reloj, the clock tower and principal entrance to this area, as well as the mayor’s office and the nearby San Pedro square. Also in the historic center are a number of churches and museums which are worth visiting. The Inquisition Palace, the former trial site of those accused of religious crimes, today houses the Historical Museum of Cartagena. The exhibition here outlines both the history of the city and the attempts of locals to preserve it. The nearby Gold Museum has a large collection of a collection of gold, ceramic, shell and bone exhibits. These items help trace the history of the Zenu people, who inhabited the region between 200BC and 1600AD. Important religious sites located within the historic city include the Church of San Pedro Claver, a building dedicated to the first ‘new world’ saint who was anointed for his work promoting slaves’ human rights. His remains are located within the building, as is a small architectural museum. The Cathedral of Santa Catalina de Alejandria, also known as Cartagena Cathedral, is one of the oldest in the Americas. Construction of the original temple beginning in 1577, though it has since undergone heavy restoration works. Another impressive building is the Santo Domingo Monastery, a 16th century religious site, which housed friars from the Dominican / Preacher Order until the mid-1800s. Cartagena’s other main attraction is the 19km of beach located in and near the city. The closest to the old town is that stretching along Bocagrande, a strip of hotels, condos and restaurants popular with Colombian tourists. Other frequently visited areas include Bocachica, Marbella, Laguito and the Bahia del Castillo Grande. These areas all have established resort and tourist infrastructure, but the beaches here are, in the main, pleasant rather than spectacular. You'll find far superior beaches in Baru, located a short boat ride away. The best of these is Playa Blanca, which is as, its name suggests, a white sand beach / turquoise sea site within an hour of Cartagena. The beach has a relaxed atmosphere, with plenty of options of places to buy coco loco (a rum cocktail served in a coconut) and fresh seafood. Trips to Baru leave from a small harbor just outside the clock tower entrance to the walled city. Most visitors arrive on a day-trip, which costs around 50,000 COP and sometimes includes lunch. This does not include the 12,000 COP entrance fee to the park you will have to pay separately. A large number of such tours leave every day, meaning the beach is easy to access, but these trips make it difficult to experience the beach at its best due to the crowds which will arrive with you. A better option is to stay overnight at Playa Blanca. Accommodation options have proliferated there in recent years, though the vast majority remain in the budget-middle range, rather than luxury resort accommodation. Walk about 15 minutes along the beach to find the most secluded options, which are generally rustic cabañas or hammocks mounted on the beach. The most upmarket facilities in Baru are in Cholon bay, where you'll also find the Sportbaru resort. Travelling another hour by boat from Playa Blanca are the Rosario Islands. Beachfront is not so ample here, but the better snorkeling and diving opportunities partially compensate. Cartagena has a small national and international airport right in the heart of the city. It is served by flights from all major Colombian cities, as well as flights from several destinations in North and South America. The city is also well connected into the local bus and intercity coach network. These leave from the central transport terminal 24 hours a day to a wide variety of domestic destinations. Within the walled city itself the most pleasant way to get around and experience the city’s charm is on foot. The distances between sites are not huge and walking along the narrow cobbled streets is highly enjoyable. If you would prefer not to walk, one alternative is to make use of the horse-drawn carriage rides on offer from most of the city’s main plazas. If you're going further or want to leave the historic center, the easiest way to do so is by catching one of the numerous taxis circling the area. Be sure to agree the fare before you get in as the taxis do not have meters.